Summer is for salads, as you know, and blue skies and bare feet and rosé and all the rest. And every year I say that summer isn’t over until it’s over, which might have something to do with being married to a teacher who is back in the thick of things even though it’s still August and there are still so many tomatoes to be eaten. But I’m actually feeling ready for fall this year, thanks to cooler temperatures and the very autumnal-tasting early season apple I bought at the farmers market this weekend and a general readiness for the sort of depth of spirit that comes with less-sunny seasons. Yet I know I’ll miss the warmth soon enough, and I definitely have a few more desserts to make before the berries and peaches and nectarines leave the market, so I’m soaking it in. Seasons are just science: an outcome of the tilt of the rotational axis of this strange spinning globe we call home and its relation to the burning ball of fire way out there in space that keeps us warm. But that’s not what we think about when summer turns to fall. We think instead of changing temperatures and precipitation and the color of the leaves and the sun or lack thereof. And those are just the obvious things—the seasons are also about much more, their other effects far less tangible or scientific. They’re intricately connected to our rhythms and routines and traditions, and my emotions get muddled into them, too. I realized this summer that I’ve had a run of weird Augusts, not the least of which was last year’s, and this one has been notably not weird, void of the sort of transitions I’ve come to expect at this time of year. But I have that familiar feeling in my bones anyway—that anything could happen next, that the leaves are going to turn so very soon and life will keep changing and changing and changing as it always does. The other day, as I walked down to the coffee shop for a mid-day break, the air felt sparkling and electric, reverberating with anticipation and hope, reminding me of Augusts past. Because as much as those times were full of strangeness and confusion and even pain, they were also brimming with a sense of newness and hope and possibility. I guess I’m always looking for connection, which is what I love about food blogs, when it comes right down to it, and why I write the way I do. I remember exactly what I thought when I first discovered people writing about food on the internet way back in 2008: These people are writing about food—I love food! But it’s not just food… They’re writing about food to talk about life. That’s exactly how I see the world, where my big thoughts come from: through the lens of all the seemingly boring, everyday stuff. This is also why I love podcasts, especially the ones that are “about” science, the internet, mysteries, life in America but are actually about so much more—about everything, really. I am currently obsessed with Starlee Kine’s Mystery Show, in which Starlee solves mysteries…and also asks everyday people interesting questions that reflect an actual interest in their lives and lead to fascinating and thought-provoking and sweet conversations, the kind that make me cry while stretching after a run or walking back from the market or hand washing my most annoyingly delicate clothes in the sink—you know, living my super normal life. Which brings us back to food. In my super normal life, I do a lot of eating, and it’s the best simple joy I know. Because it really doesn’t have to be complicated to be good, especially in the summertime, when so much beautiful produce is at hand. Take melons. I spent my entire childhood entirely unimpressed with all melons except the watermelon, but I’ve since learned that they’re really quite delicious, especially the more interesting varieties that are increasingly easy to find, like Piel de Sapo (my very favorite) and Charentais (in the photo above). I’m most impressed when I take them in a savory direction, and composed salads are as easy and good as it gets. This is my favorite. It’s just a salad. But if you like, it can be an awful lot more. On a large plate or platter, assemble the melon, cucumber and figs in layers. Drizzle generously with olive oil and lemon juice or red wine vinegar. Finish with as much thinly shaved Parmesan and basil as you like, Aleppo (or other) pepper if using, cracked black pepper and flaky salt. happy podcast listening and summer transitioning time! 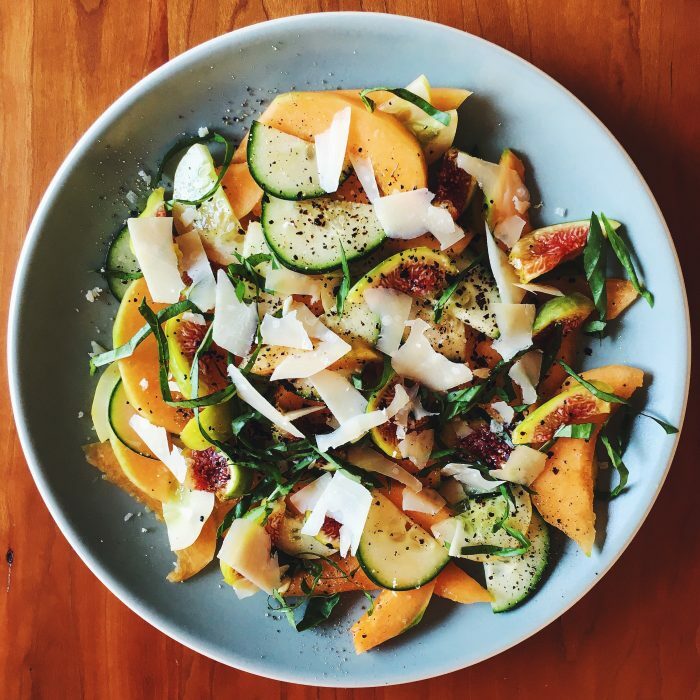 I love melons too and I love the savory twist to this fruit salad. I can’t wait to try it! Thanks for sharing. Beautiful photo, too! Thanks, Connie! I hope you give it a try – let me know what you think if you do! and by the way, lovely recipe!